CSS is responsible for webpage layout. Without CSS, a webpage looks like just a bunch of disordered HTML elements. How Can I Add Custom CSS Codes or Classes? 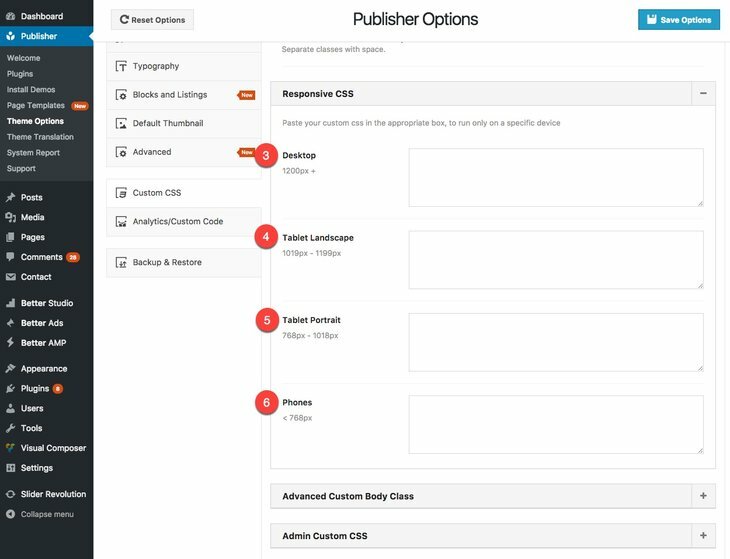 Publisher gives you the ability to assign CSS codes for: whole website, Responsive view, Admin area. Also you can add new classes to <body> tag. 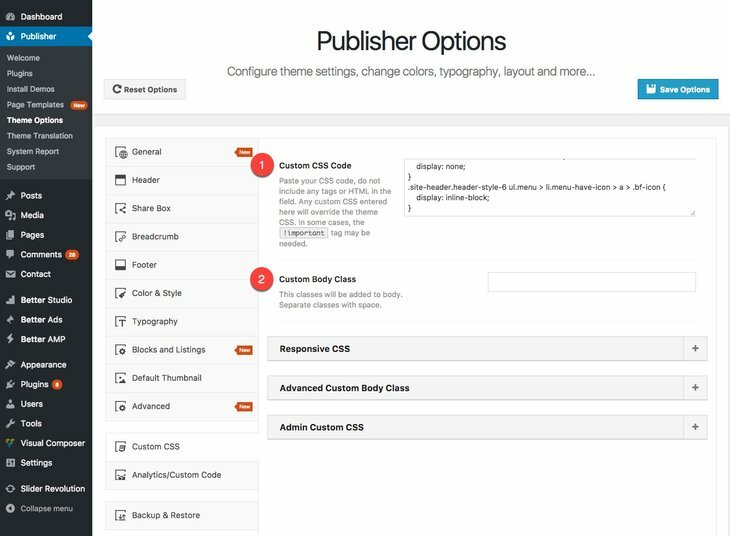 For this purpose go to Publisher → Custom CSS. 1- Custom CSS Code: Paste your CSS code, do not include any tags or HTML in this field. Any custom CSS entered here, overrides the theme CSS. In some cases, the !important tag may be needed. 2- Custom Body Class: These classes will be added to body. Separate classes with space. Now you can assign CSS properties to these classes in the above field. 3- Desktop: These changes only apply to viewports bigger than 1200px. 4- Tablet Landscape: These changes only apply to viewports between 1019px and 1199px. 5- Tablet Portrait: These changes only apply to viewports between 768px and 1018px. 6- Phones: These changes only apply to viewports smaller than 768px. 7- Categories Custom Body Class: These classes add to body of all categories. Separate classes with space. 8- Tags Custom Body Class: These classes add to body of all tags. Separate classes with space. 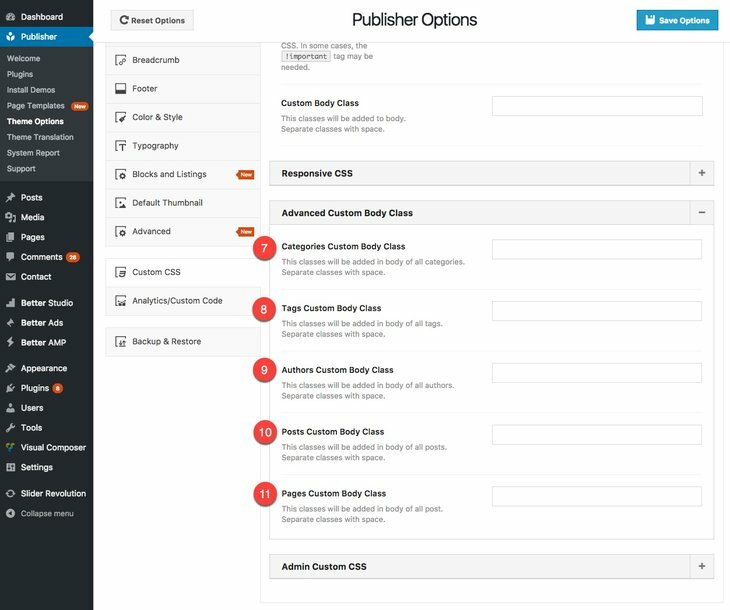 9- Authors Custom Body Class: These classes add to body of all authors. Separate classes with space. 10- Posts Custom Body Class: These classes add to body of all posts. Separate classes with space. 11- Pages Custom Body Class: These classes add to body of all page custom posts. Separate classes with space. 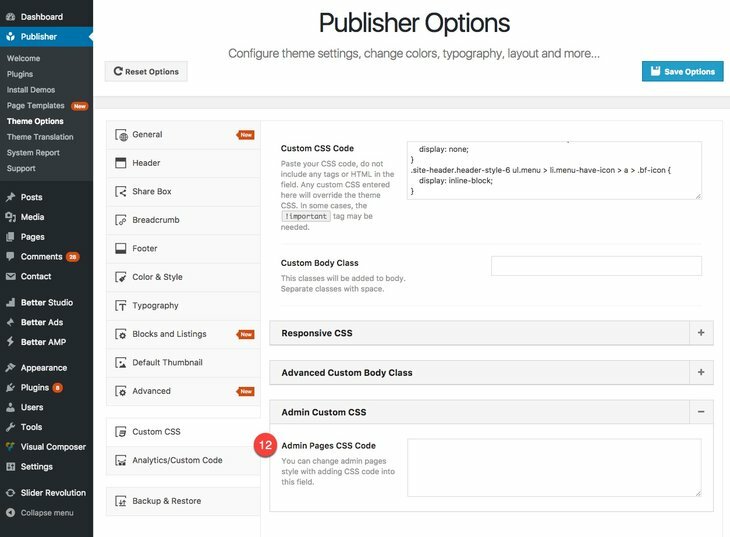 12- Admin Pages CSS Code: You can change admin pages style with adding CSS code into this field (Admin means WordPress admin area).